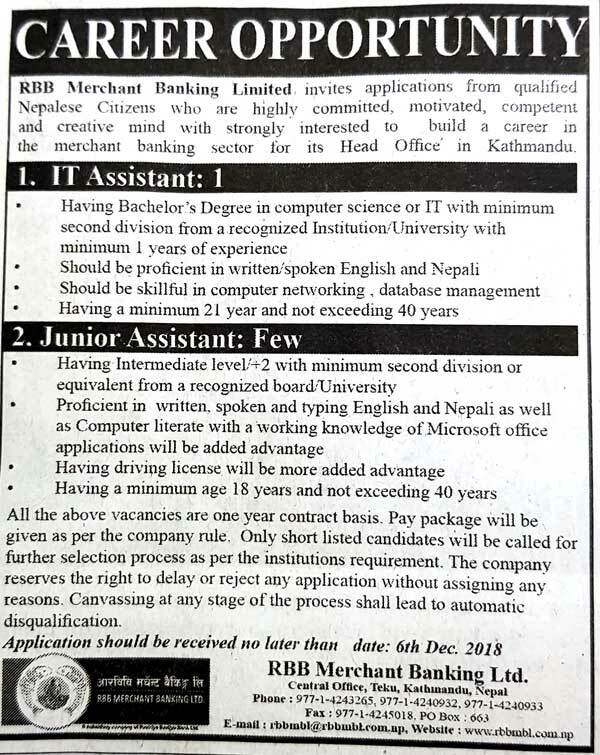 RBB Merchant Banking Limited invites applications from qualified Nepalese Citizens who are highly committed, motivated, competent and creative mind with strongly interested to build a career in the merchant banking sector for its Head Office in Kathmandu. All the above vacancies are one year contract basis. Pay package will be given as per the company rule. Only short listed candidates will be called for further selection process as per the institutions requirement. The company reserves the right to delay or reject any application without assigning any reasons. Canvassing at any stage of the process shall lead to automatic disqualification.